My son, Galen, had been shooting hoops since he was 4, barely big enough to hold the ball. Now 11, he was 5-foot-6, a head taller than his mom, and light and agile on his feet. He could sink a basket from anywhere on the driveway, including a shot that passed between the branches of the maple tree on its way to the net. Basketball, I’d long believed, was his destiny. Galen was a standout his first season at the YMCA, when he was 8. The next year we signed up for the club team, which turned our six-week rec league season into six months of intense tournament play. When it became clear that every kid on his team had been a YMCA standout (or had bypassed the Y league altogether), I arranged for him to take private lessons with the captain of the basketball team at the college where I teach. He played in a 3-on-3 league over the summer and, at the conclusion of the club season the following spring, he began playing with an Amateur Athletic Union team, a national youth sports organization that, in addition to increasing the level of competition also expanded our travel radius to a tristate region. Three weekends a month, from October to July, we crisscrossed the Upper Midwest traveling to tournaments. All the parents complained about the endless driving, the lost weekends, the hours spent in the bleachers, yet all agreed the sacrifices were worth it. They were the cost of success. I was no stranger to the world of hyper-intense sports. I’d grown up swimming and had spent my share of weekends camped out in stifling, chlorinated natatoriums. I was good enough to swim, on scholarship, at a large Division I university where I routinely lost to swimmers who’d go on to win Olympic medals. Twenty years later, I still swam every morning and I still believed in the power of sports — to focus both body and mind, release stress-busting endorphins, forge lifelong friendships. Even the defeats were useful. Anyone who’s ever loved a sport has learned the hard way that sometimes life isn’t fair. 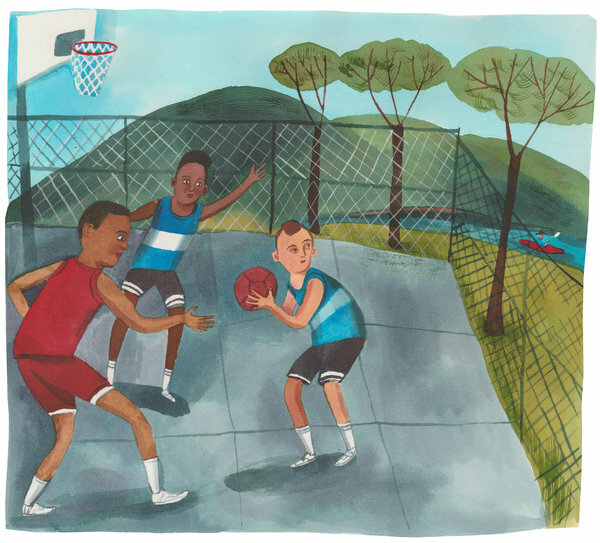 But while I (most of the time) looked forward to swimming practices and meets, the chance to test my mettle against my peers, basketball tournaments made Galen nothing but miserable. He’d punish himself for days over missed shots and flubbed passes, even if his team prevailed in the end. Whenever a shot went in, he looked more relieved than happy, grateful not to have screwed up again. During the lulls between games, he sat by himself, brooding into his iPad. He didn’t want to talk to anyone, not even me. “Builds character,” he said, half-grinning. I could tell he didn’t believe it, not all the way. I’d begun to wonder whether it was even true. Did youth sports really impart discipline and determination in ways that other activities — like learning Greek, say, or taking long hikes in the backcountry, or painting a fence — could not? How often does a childhood sacrificed on the altar of sports really confer advantages in adult life? “Did she have fun at least?” I asked the dad. I’d been afraid to utter the Q-word for months. Saying it felt a little like suggesting we rob a bank. “If I quit basketball, what sport do I play?” Galen asked. “I’m only trying to consider how our light is spent,” I told Galen. Over the weeks and months that followed, the idea grew on Galen. Freed from practice, he took to riding his bike and skateboard for hours, turning into the driveway as the last of the dusklight drained from the sky, his cheeks ruddy and his shoulders relaxed. He spent far more time outside without basketball weighing on his mind and schedule. He didn’t become a nobody or stop being an athlete. Instead, both his definition of sports and his circle of friendships expanded. In the fall, he signed up for a kayaking class and went out for the junior high cross-country team, a far more reasonable eight-week season. When the snow fell, he joined a skiing club. Each new activity introduced him to new friends, and in some cases gave him a chance to hang out with his old basketball teammates without the pressure to win a game. This summer he’s heading to the Boundary Waters in northern Minnesota for a weeklong canoeing trip. Now that the weather’s warm, Galen’s back to shooting hoops in the driveway. More than once, I’ve looked out the kitchen window and spotted him dribbling the ball between his legs while talking trash to an imaginary adversary. He fakes right, spins to the left, stops on a dime, swishes a jumper from behind the garbage cans. When he exultantly raises his arms above his head, full of joy and confidence, I know the decision to quit was the right one. A slam dunk. David McGlynn is an associate professor of English at Lawrence University in Wisconsin and the author of a memoir on fatherhood, to be published in 2018 by Counterpoint Press.